Good News for Puzzles and Sudoku solvers is that there are many different championships held for Sudoku and Puzzles across the world every week. To participate in most of these Championships you don't need to travel anywhere. Most of these puzzle championships are online and you can participate sitting at your home. We used to list these championships earlier every week. We have stopped now listing these championships on our website. However here is list of our listing for these championships for historical purposes. As list is very big it is divided into two pages. This page lists championships held in year 2011 end. 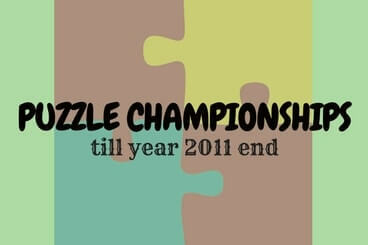 You can check our another puzzle championships page for puzzle competitions held year 2012 onward. 4 Season Cup- Winter "L'alphabet du NO (Sudoku)"